You'll never be S.O.L. with this combat bowie by your side. 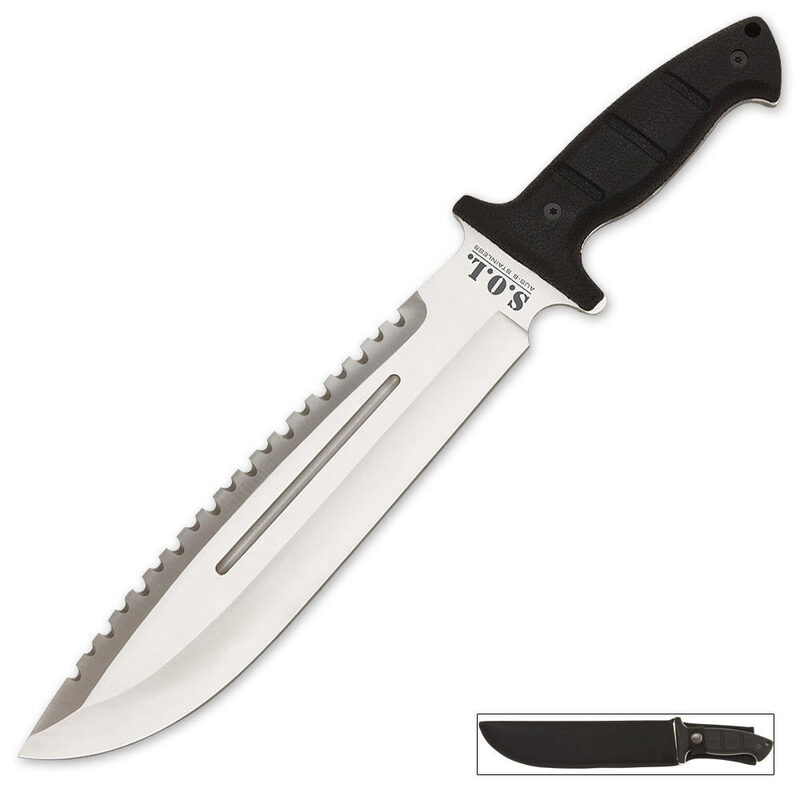 Features include a tough full tang construction, polished AUS-6 stainless steel blade, ABS handle scales and serrated saw edge on the blade's spine. The center blood groove and S.O.L. etching add to this pieces attitude. Includes black nylon sheath with belt loop and snap clasp. 9 3/4 in. blade, 15 in. overall. I absolutely loved this knife. However, when I actually used it, the blade broke. Change the steel, and do an actual good heat treatment on it. this bowie is very durable, has a good grip to it and chops small branches with ease. the sawback however dose not perform well. but it dose make it look pretty cool. plus its only $20. If you are looking for a good blade to clear some brush or just trekking through the woods cutting fallen timber for firewood on your next camping trip. this would make an excellent knife to have by you side. Great knife monogram was a little hare to find but gave as a Christmas present. Very sturdy...got these on a BOGO promotion..very good deal!! Got the knife during the BOGO sale. For the price you can't wrong. When I received mine it did require a little work on the Work Sharp, but, now it's wicked sharp. The handle scales are ok and allow you to choke-up on the blade for finer detail work. The sheath is decent and I liked that it had a snap retention strap instead of a cheap velcro closure. All in all not a bad full tang blade! I plan on buying at least two more when they're on sale again. I ordered two of these knives on the 'bogo' free shipping special about two weeks a go-this is a really good knife. Post's had said 'not real sharp...bad seath, not real thick blade, etc...' What the H**l do you expect for about $ 10.00/knife! My two knives came real sharp otb...this is a big knife, not a razor! Sheath is fine...it's a $10.00/knife bargin! GREAT KNIFE,GREAT VALUE,JUST RECEIVED 2 KNIVES,BOUGHT ON BOGO SALE,MORE THAN I EXPECTED,SOLID,GOOD FEEL,WILL BE A GREAT EDITION TO OUR DEER SHACK FOR ALL AROUND CAMP USE ! CAME SHARP ! THANKS FOR THE DEAL BUD K !